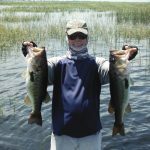 This week on Lake Okeechobee the winds have been light for the most part and the water temp has been in the 90’s. The water clarity is good throughout the lake. The lake has risen quite a bit and that has spread a lot of the fish out. The morning bite is in the Kissimmee grass. The best bait this week has been a swim jig in white and a spinnerbait. This pattern is over by 08:00 then I have been Flipping/Pitching a 1oz. Black/Blue jig into the Pencil Reeds and Cattails. Good areas to fish are J&S, Kings Bar, Grassy Island and 3rd point. Here’s a picture of my buddy Brock with a couple of fish we caught this week.